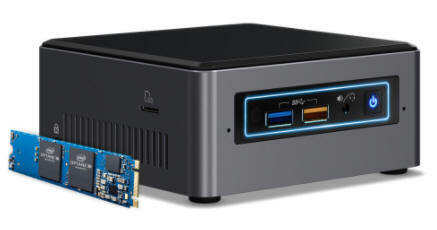 Dimensions 4.53" x 4.37" x 1.89"
Simply NUC7i3BNHX1 Complete Systems come with Intel® Optane™ Memory, RAM, Hard Drive and the Operating System Pre-Installed and include a one year warranty. – Support for user-replaceable 3rd-Party lids. The Simply NUC7i3BNHX1 System is equipped with Intel’s newest architecture, the 7th generation Intel® Core™ i3-7100U processor. The Intel® Graphics 620 with 4K display capabilities provides brilliant resolution for multi-monitor desktops, digital signage, gaming and home theaters. And with both HD Audio for personal audio support, and 8-Channel Digital Audio available on the HDMI and DP (Type-C) connectors supporting 7.1 Surround Sound, you can support an immersive audio experience. The NUC7i3BNHX1 includes 16GB of Intel® Optane™ Memory Pre-Installed, which makes you ready for the future. By pairing Intel® Optane™ Memory with high capacity HDD storage media, you get amazing performance and responsiveness as well as shorter boot times, faster application launches and more responsive browsing- exactly what you want for work or play. Designed for Windows 10, the Simply NUC7i3BNHX1 has the performance to stream media, manage spreadsheets, or create presentations. There’s also a high-speed USB 3.0 charging port that lets you easily charge your tablet or Smartphone quickly. And for peace of mind you’ll get embedded security that helps keep threats out, user identities and credentials safe, and your data protected. Operating Systems offered by Simply NUC have been modified for proper operation with Solid State Drives and have performance tweaks. Microsoft Windows was designed for operation with Hard Disk Drives and omitting these changes can shorten the life of the SSD significantly.